Help skin to a bright and youthful appearance with this rich, nourishing treatment. Kaeso Mulberry Age Utopia Facial Moisturiser is a gorgeous, moisture-rich formula that nourishes and rehydrates skin. 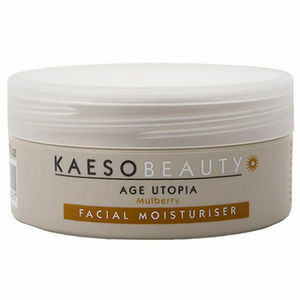 Containing extracts of Mulberry and Collagen, it helps to improve skin tone while promoting elasticity. It's mild enough to use every day, but tough enough to maintain moisture and strengthen skin's protective outermost layer. Help your clients' skin stay young-looking and with great tone! Comes in a 95-ml pot.